With over 4,500 people and companies following me on Twitter at @ariherzog, why did I create a new account at @ariherzogdotcom last week and ask people to follow me there instead? With over 8,400 people in a LinkedIn group I manage about social media marketing, why did I create a new group using that dotcom name and ask people to join that? Looking back to January 1 when I blogged about creating a new brand for myself, I ask these questions and laugh. My motivations were honorable. I wanted to create new social networking channels on some of the leading platforms and watch them grow. But I’m not a business. I’m a person. Yeah yeah I have a personal brand but I’m transitioning the service I sell and moreover I wonder what value one would receive from a new group or page that one can’t receive from who and where I am today. That Twitter account I created at @ariherzogdotcom? I deleted and recreated it as an automated stream of videos I watch, comments I write, and stories I like. There will be no manual activity over there and I will not reply to anyone from that account. Over time it will serve as a running commentary of my internet life. That Facebook page I created for ariherzogdotcom? It’s entered deletion mode. If you want to interact with me on Facebook, click the follow button in the top right of my profile. Those LinkedIn and Google+ groups? They are already gone. I already had a Google+ profile and I’ve begun using it more frequently. Over 2,800 people have me in their G+ circles and you can too right here. That Pinterest page I created? I’m leaving it alone and will experiment with it more over the coming months. My local friends Julia Campbell and Sue Zimmerman are huge users of Pinterest (let alone my sister) and I will turn to them with questions. If you tweet and no one reads it, did it ever happen? Put the "social" back in social media. I realized that instead of creating new social networking channels, it made more sense to leverage my existing channels. With some 10,000 followers of mine on Twitter and Google+ (and members of that above LinkedIn group), I want to be more social this year. I want to be more interactive to increase the likelihood people will read my tweets and social updates. Twitter: Last year I followed approximately 100 people. Right now, I’m following over 1,000. I find tweeting is most productive on my iPad because I can swipe through tweets more quickly than using a smaller phone screen or the desktop mouse. I am using two accounts at @ariherzog and @ariherzogdotcom. The first is all manual and the second is all automated. When I retweet people with commentary why, that’s the first account. When I comment on Livefyre-powered blogs, that’s the second account. LinkedIn and Facebook: Last year I unfriended lots of people for lots of different reasons. I am in the process of flip flopping this year because of Thom Singer’s coffee, meal, and beer rule. I started incorporating this idea on LinkedIn last fall when I terminated 61% of my connections as a direct result of Phil Gerbyshak’s 5-prong test to evaluate if a connection should remain connected. Whereas Phil indicated explicit lack of interaction since first contact is a reason to unfriend, Thom is OK with no interaction as long it was substantive. It is for this reason that I’m sending a lot of Facebook friend requests to people who I have eaten and drank with; and to people who I know well enough to trust them to see my wall updates for friends. Everywhere Else: I am using Google+ and Pinterest as indicated above. I am using Foursquare to check into places and receive instant coupons. I have accounts on a dozen or so other social networking platforms and I use them to varying degrees. The scientific process must include questions and behavioral changes; and I’m grateful I answered my questions inside of four days instead of waiting months. If we’re not friends on Facebook or LinkedIn, and you meet that coffee, meal, and beer rule, send me a request to connect. Otherwise, follow me on FB and join the big group on LI. With Twitter, Google+, and Pinterest, follow whichever account you want. I’m opening the social networking gates in 2014. Thanks for reading and exploring digital media with me. Google Analytics tells me that 34,532 unique visitors (including you) came here over the prior six months. Over 90% of visitors arrived for the first time. I was most surprised 61% of you come from Windows. I thought there would be more Mac and mobile visitors but those segments are clearly rising. Nearly 20% are coming from mobile devices. As for the 2,300 visitors arriving from clicking links across social media, the top three referrers were Facebook (36%), Twitter (31%), and LinkedIn (12%). I suppose I should be blogging more frequently and sharing posts to enable more people to click links and visit. But I’ve lost that energy lately. It is the 14th day of November and this is my first post of the month. That is a telling statistic compared to my blogging frequency of the past. I guess I only want to share something when there is something worth sharing. The Library of Congress did not know the names of French brothers Michel, age 4, and Edmond, age 2, when the institution uploaded this photograph to Flickr in the summer of 2008. 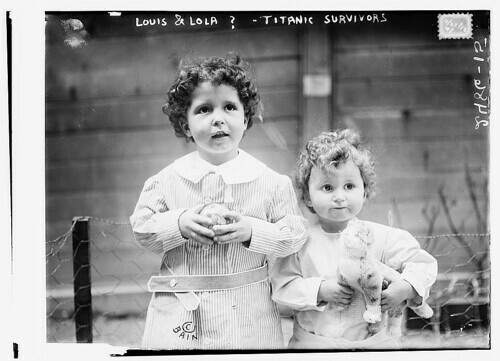 They knew the duo were Titanic orphans. They didn’t know anything else. The LOC now has that data. They know the kids’ father and why he changed his name when boarding Titanic. They know the name of the woman who took in the kids and raised them. Through Flickr’s users who viewed, commented, liked, and shared that photo, the LOC can now tell a story for what was once a story-less photograph. The Smithsonian Institution, the New York Public Library, the National Library of Ireland, the NYC Center for Jewish History, and the Stockholm Transport Museum are among worldwide cultural institutions that make up The Commons — a repository of photographs enabling anyone to visit and learn the culture of who we are. The past is a click away. Whereas Flickr’s Commons is restricted to photos, the Google Cultural Institute encompasses videos and interviews to revisit the past. At a time when the world mourns the tragic loss of life in a small town called Newtown, it’s important to remember the past — because remembering the past helps us reconnect with our future. The following is a written by Chris Apple. His profile links don’t work anymore. I don’t know about you, but as a real estate blogger, I tend to read a lot of blogs during my workday. Some of the blogs I read on any given day range in topics from SEO blogs, real estate blogs, social media blogs, and blogs about blogging. Say that three times fast! iGoogle is an Ajax-based personal web portal. Basically, it allows users who are signed into their Google account to customize their homepage with lots of cool stuff. You can add RSS feeds, YouTube subscriptions, personalize it with custom themes, and even view your Gmail inbox, all in one place. Offering a wide range of useful gadgets, including calendars and calculators, and even a joke-of-the-day gadget, iGoogle’s custom features can easily be added to your homepage with the click of a button. As you can see, I use iGoogle for all of my RSS feeds. It is a great way to get a quick snapshot of all of the blogs that I subscribe to. When a blog that I subscribe to publishes a new post, it shows up right there on my iGoogle homepage. First, you’ll need a Google account. Don’t have one yet? Sign up here. After you register and log into your account, you will be able to access all of the features that iGoogle has to offer. This is really easy. Click this link and follow the directions. Once you have a Google account and made iGoogle your homepage, the fun begins! RSS stands for Really Simple Syndication. Almost all blogs have some form of RSS feed that syndicates their content out on the web. The next time you are online and find a blog that you want to subscribe to, like mine (shameless plug is at the bottom of my article), click on the RSS icon and you will be asked to add it to your Google homepage or to Google reader. Choose ‘Google homepage’ and the feed will be added to your iGoogle homepage. Another cool feature of iGoogle is the ability to customize your homepage with themes. They even have artist themes, designed by Look, for the Change theme and Add stuff links in the upper right-hand corner of your iGoogle homepage. Staying up-to-date with all of the blogs I read can be a difficult task and a serious waste of time with bookmarks alone. In my search for an easy way to organize and manage all of that information, I found that iGoogle is a serious time-saver and a great place to store feeds. If you are looking for more in-depth information about iGoogle, I suggest watching this video. What is your favorite theme or gadget? I’d love to hear about them in the comments below. Judging by an analysis of the most-visited websites during the first 11 months of 2010, in comparison to 2009, Facebook hit first place and surpassed Google. When you consider Facebook founder Mark Zuckerberg was featured as TIME magazine’s person of the year, not to mention ‘The Social Network’ film success, is the top honor a surprise to you? Care to guess this year’s top website? Will it be Facebook, Google, or someone else? If the above title drew you in, good. Keep reading. Thousands (millions?) of bloggers and other webmasters around the world use a free tool called Google Analytics to track website visitors and click-through metrics. I use it, and many bloggers I know also do. We’re all using it illegally. But, even if I had the GA statement, I’d still be violating your privacy because the Google text above (in both versions) lacks details about how third parties use your data. While you can opt out on a browser level, is that the best Google can do?